Nisha & Jiten's mehndi, held in the lawn (at the Sheraton), was an out of the box event with a japanese theme - Floral Fujiyama. 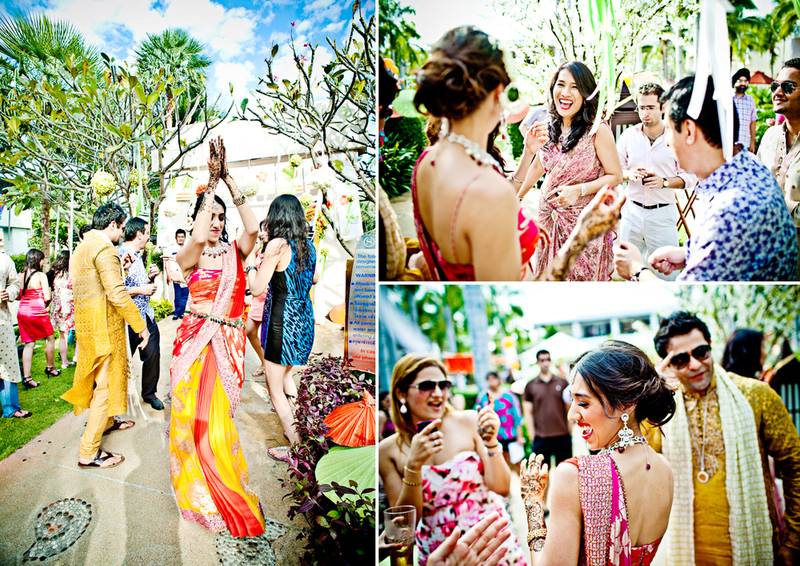 The mehndi was a journey through a Japanese garden with decorated cabanas. With shades of yellow, light green and orange, the decor, the props and the flowers made for a perfect mehndi on a gorgeous sunny afternoon in Hua Hin. Nisha's outfit was striking and made her stand out against the floral theme of the mehndi decor. Nisha walked in, with her family & friends, with a beautifully decorated parasol. Beautifully decorated cabanas were used to entertain guests with foot massages, hookah and mehndi corner. The event was very colorful with guests and family enjoying the dance numbers played by the DJ. With anticipation for the Sangeet night building up, the japanese mehndi was a perfect start to the wedding festivities for Nisha & Jiten.